Kingston, 1 July 2014 - Acting as a bridge-builder between regions, the SRSG convenes each year a Cross-Regional Round Table on violence against children. This important annual forum enables regional organizations and institutions to assess progress achieved, reflect on trends and common concerns, share planned initiatives and identify opportunities for cross-regional cooperation. This year and for the first time, the Round Table also addressed a priority area of common concern: the prevention and elimination of violence in early childhood. Organized in cooperation with UNICEF and the Government of Jamaica, who had also hosted the 2012 Caribbean Regional Consultation on Violence against Children, the two day meeting gathered representatives of the Caribbean Community (CARICOM), MERCOSUR, the Inter-American Commission on Human Rights, the Council of Europe, the European Union, the Council of the Baltic Sea States, the League of Arab States and the Latin-American and Caribbean Movement for Children (MMILAC). 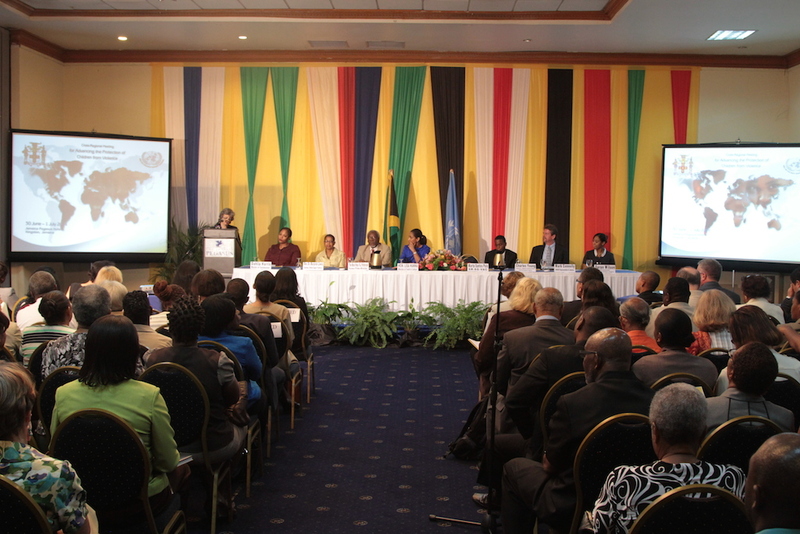 Representatives from the Jamaican government, and from national institutions, the academia, civil society organizations as well as Jamaican children also shared their expertise, concerns and recommendations for accelerating progress in the prevention and elimination of young children’s exposure to violence. The very rich exchange showed that the momentum created by the UN Study on Violence against Children and its process of follow-up continue to produce very good results. Participants reported on new strategies and action plans, new pieces of legislation, information campaigns and in depth studies. The meeting also showed convergence in crucial areas of concern and called for violence against children to be recognized as a priority within the post-2015 development agenda. Early childhood is the period during which children experience the most rapid process of growth and development and also when children’s path is shaped. As highlighted by the significant research presented at the meeting, the first 1000 days of life are crucial for a child. Surrounded by a nurturing, caring and protective family environment, children enjoy limitless opportunities for healthy development, enhanced resilience and cognitive skills, as well as strong confidence and self-esteem. But exposure to abuse and neglect may irreversibly damage the development of children’s brain, as well as hamper their emotional and physical health, and compromise their learning potential and well-being. There is growing evidenceof the benefits of early childhood programmes and good parenting and positive discipline initiatives for the prevention of violence in early years; but much beyond, the positive impact of these initiatives is equally felt on the child’s life cycle and on the prevention of the perpetuation of violence between generations. With this in mind, representatives from Regional Organizations and Institutions expressed commitment to strengthen their fruitful cooperation to prevent and address violence, abuse and neglect in early years and in particular, to raise awareness and document good practices on positive parenting and positive discipline, as well as on the negative impact of violence and neglect on child’s development and well-being; to mobilize political engagement to end impunity and to prevent and address violence against young children, including through the development of national, multi-sectoral integrated strategies and comprehensive legislation to ban all forms of violence against children, including corporal punishment; to promote policies and programmes to support families and caregivers in their child-rearing responsibilities, and to prevent child abandonment and placement in residential care; and to consolidate data and research on violence against children in early childhood. The outcome of the meeting is captured in the Round Table Conclusions and Recommendations. Participants reaffirmed their commitment to continue to meet on a regular basis. At the invitation of the Council of Europe, the 2015 Cross Regional Round Table will be held in Strasbourg (France).